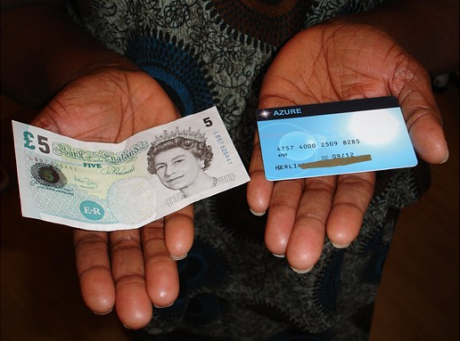 The Azure card is topped up with the equivalent of £5 a day. Credit: Herlinde/Women for Refugee Women. I get up maybe 8 o clock, maybe 9 o clock. It depends what I have to do in the day. Then I go downstairs and have breakfast, then I go back upstairs and maybe clean my room, then – if its a Monday I don't have anything to do, if it's a Tuesday, because I'm signing on weekly I'll go to London Bridge. After that, the whole week I'm at home, because I don't really have stuff to do. Signing on is horrible. If you go in the morning, the queue is mad. At 9.30 the queue goes round the garden, there's more than 100 people, you stand there for an hour, then you get inside and you wait for another hour. Because there's such a long queue in the morning I'll sleep during the day and go in the afternoon...They're so intimidating. The way they talk to asylum seekers is not nice – whatever question you have, they say “We can't help you here”. They have advertisements for you to sign up to go back to your country. It's a sign on place specifically for asylum seekers. I get my weekly shopping on Tuesday because that day they give me travel. I'm on Section 4, which means I get an Azure card, and not cash. That's for the week for everything, for groceries, clothes, everything you need. I get £35 a week on the Azure card, it's like a top up card. You have to use all your money in the week. If you leave more than £5, they take it off and put £35 on the next week. Because they don't give me cash, I struggle to travel around, so I have to always do my shopping on Tuesdays when I have a bus ticket. I can only take two buses – one there and one back. I only have two tickets, for those buses. During the rest of the week, if I'm lucky, I can meet a friend and they'll give me a £10 or a £20, then I have to budget that money so I can get to appointments. I have to make sure that everything is walking distance. Recently I've enrolled in a college, but I have to make sure it's walking distance. We have a house manager who comes to check on us. This house is much nicer than my last one. At my last house, I was sharing a tiny single room with a Sri Lankan woman. Now I have more space, but before there was no privacy because I was sharing with a stranger. There's three other people here, all asylum seekers, one from Turkey, one from Eritrea, and one from Nigeria. They all have kids and it can be loud, but that's ok. Every floor has a bathroom and a toilet, it's kind of ok. The accommodation is only for asylum seekers. Since I've been waiting for my trial, I've had to move three times. They just tell you you're being moved. They told us on Friday, and we're moving on Monday. Imagine. You just have to pack and go. The Home Office is intimidating and scary. You can't know what they're thinking, but because of what I've been through already with them, I already know they're going to say “no”, I already know they're going to say “you're lying”. You just never know with them. It's just so uncertain, you don't know what's going to happen, you don't know if they're going to grant you, you don't know if they're going to give you this nasty refusal. Inside, when you go to sign on, you don't know if they're going to call you inside for an interview inside. You don't know if they're going to give you a refusal straight there and then. They can do anything they feel like doing. You're just constantly worried and scared. Sometimes you don't know if you're going to be stopped. You're lucky if, like me, my case is in court, so really they can't do anything at this time, but imagine if I went to court and they said “no”. My support would be stopped, because my rights have been exhausted. It's so much stress. They don't care, they really don't care. Whatever you say, or however much you need something or are telling the truth or are desperate, they'll listen to you and still tell you the same thing: “I don't believe you, I can't help you, contact your caseworker. Contact your lawyer”. They just make everything so complicated, everything is so hard. To change things – well, like me, you come from your country. I did not know about asylum. You don't know what's going to happen to you. Eventually you find out that there's something you can do to help yourself, and to secure life. So I say, ok, let me go and seek that. Now I know I was brave, but when I went I was very naïve. The burden of proof is on the asylum seeker. I came from persecution, but some people come from war. They just run. They have nothing. I thought that claiming asylum was all I needed to do, but you have to do so much more. The evidence, the burden of proof is so big. They push people so far, so they start forging things or start having to lie about evidence, because they're thinking what am I gonna do, I can't go back. The burden on proof should be on the Home Office, not on the person who's running away from persecution. Not on the person who's suffering, the person who's scared of being imprisoned, who's scared of being discriminated. It shouldn't be that way. The person who's vulnerable should not be the one who has to try to prove. The burden should be on the other side. Being an asylum seeker is something like a label. When you go to Tesco to pay and pull out your card, they'll say “oh”, and take it from you, and charge it. Already they're like: “She's an asylum seeker”. Or my friends, when they go to pick up their money from the post office. The way they treat you is just like, you're beneath them. For me, the white people that I've come in contact with are nice. But some are nasty. The only time when I feel like I'm being labeled is when I pay with my Azure card. But I don't really care because I have to survive.